Noticed this just today. I’m running windows 10/x64 Pro. I had some windows update installed earlier in the day. I happened to notice afterwards that Notepad++ (6.9.1) was crashing consistently on launch. I tried installing a few older versions of Notepad++ and they too were crashing. Finally I tried rolling back KB3147458 and after reboot I found that notepad++ was launching/working ok again. The question I would have is why is notepad++ conflicting w/ this particular windows update. just finished updating my win10/x64 Pro to the mentioned build version. Npp started - works - no issue yet. Understood - but nevertheless this problem definitely exists for me. Windows 10 was “nice enough” to reinstall this KB and sure enough after rebooting NP stopped working again (as described above). And also sure enough after uninstalling this very patch and rebooting, NP started working again. So definitely repeatable for me. As I, and maybe others as well, don’t have an issue I don’t think it can be a general npp problem. In addition, it seems that this w10 update didn’t work well for others as well. I agree it might not be a NPP problem. But perhaps instead it might be a problem w/ 1 of the NPP plug-ins I’m using (which I’m assuming is differently than what you tested with). Actually after writing the answer I thought the same and installed your plugins. No problem with my windows 10 configuration. 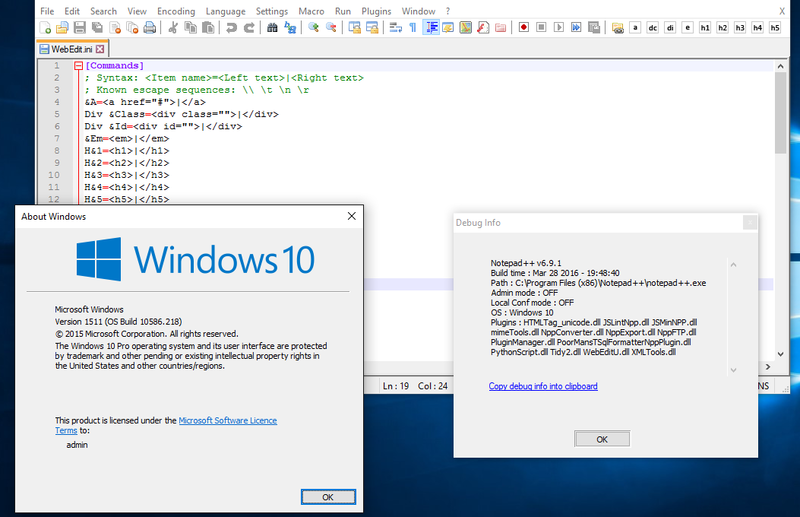 Note, I also tested without having PythonScript.dll installed. Interesting. And certainly I can’t comment on why you can’t reproduce this issue using the same plug-ins (w/ presumably same versions) and I’m using. But nevertheless, I -can- reproduce this issue consistently. To further isolate this issue, I tried selectively re-installing my user plug-ins (starting from just the base set that installs by default w/ NPP). I found that WebEdit (v2.1) is introducing the issue (but none of the other user plugins). Once WebEdit was removed from my NPP install, the problem disappeared. Is there a special setting for WebEdit you use? I’m not familiar with this plugin. Good question. I just tried a stock install of webedit and launched notepad++ (w/ the KB update in place). NPP crashed as described before. So in answer to your question, no special setting of webedit was required for me to see the issue. Your windows 10 OS/build version match what I have. Again, I’m using windows 10 pro. Can you give it a try to create another user on this w10, login and start npp? Tried it. Problem exists in the same way for a 2nd user.